Standard: GB/T 10357.3-1989 furniture mechanics performance test chair stool kind of strength and durability. Suitable for family, hotel, hotel, hotel and so on use of all kinds of table kind of furniture factory finished table kind of furniture, chairs, stool kind of furniture and for adult use hard paving single bed impact test.Does not apply to test swivel chair and ceramic, cany willow materials production chair, stool kind of furniture. 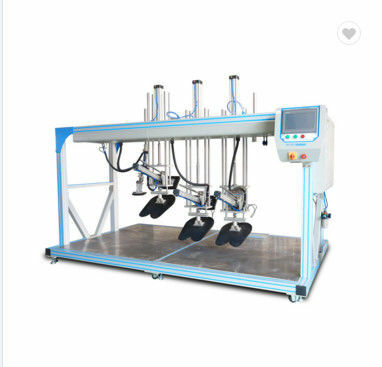 Wooden furniture impact tester simulation furniture in normal use and used to misuse, the related parts by one-time or repetitive loading conditions is the strength or bear ability test, used to test products in happen impact load conditions is the strength. Put a piece of foam on a plane, and then the impact device to a specified height (namely impact has been surface distance sample was impact the vertical distance; 2 level impact height 140 mm / 3 level impact height 180 mm/level 4 impact level 240 m / 5 level impact height 300 mm), makes it free fall, impact seat face the most destructible parts and chair stool center distance behind 175 mm parts of each 10 times. The stop on chair or stool impact a opposite legs, and then the impact on pendulum impact Angle, make its around the rotary axis free fall, toward the back of the chair top along the lateral intermediate part in the outside of the level of impact 10 times. Test bench, the impact seat surface along the middle part. L test no clear after the seat surface along the stool, should be the most easily along the impact caused by stool tilting direction applied. L if the chair is equipped with pillow depend, to stop by under impact pillow by relative direction chair leg place side, make impact pendulum and pillow on the top surface of the outside a right-angle direction, impact the most vulnerable parts. L after testing a chair or stool check the overall structure, and assess defect. The stop on a chair impact the legs, and then the impact on pendulum impact Angle, make its around the rotary axis free fall, toward is not slide side rail surface most easily damaged parts in the outside of the level of impact 10 times. 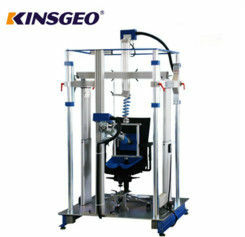 After testing a chair or stool check the overall structure, and assess defect.